Remember back when the Xbox One and PS4 were released? Remember how excited we all were? Fast forward almost a year to today and it seems like the 'next' generation of consoles has barely even got started. What happened? Delays happened. It seems all the games we were hoping to play this year slowly slipped back and back. 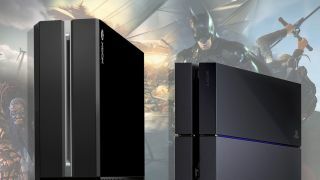 Some argue that there aren't many reasons to upgrade from an Xbox 360 or PS3 yet. Without wanting to wish our lives away, that's all going to change in 2015. Here are the 10 games we've been gagging to play all year, which we'll now have to wait a bit longer for. Okay, so Square Enix never promised that Kingdom Hearts 3 was going to come out in 2014, but there comes a point where teasing a game constitutes a promise that it'll be out in our lifetime. Square Enix originally showed off the game - or at least the idea of it - during E3 2013. Then we got a bonafide trailer in E3 2014. It's in development alongside a remastered version of Kingdom Hearts 2 for Xbox One and PS4, so we wouldn't bet against the game being delayed even further into our dotage. Not already a fan? Kingdom Hearts has one of the most bizarre premises in the video game… kingdom. It's a Japanese RPG starring the cast of Disney's most popular properties – Mickey, Hercules, Donald, and all the other greats - who star alongside the usual cast of spikey-haired anime types. Weird combo? It sure is. The series has sold more than 50 million games in its lifetime, though. So either it has a big fan base or someone incredibly rich likes it a bit too much. Battlefield: it's the thinking man's Call of Duty, and a troll's multiplayer dream. But Battlefield: Hardline has been pushed back into early 2015. In a blog post on the Battlefield website, DICE explained it wanted to make a better game than it could bring out in October 2014, the original intended release date. Of course, it was all relayed terribly positively in the post, but our takeaway was that the game as-is would be a buggy, derivative and shallow mess. The beta told us much of this already. It took place in June 2014 for a couple of weeks, and showed the game felt a bit like a Battlefield 4 expansion pack. While Battlefield 4, the first Xbox One/PS4 Battlefield game, received a decent reception, it was hardly the height of next-gen. If the series wants to uphold its good name, it needs to up its game. And boy do we want it to – we don't want it to become a derivate stream of yearly updates like Call of Duty. The Order: 1886 is one of the games we're most looking forward to in 2015. Why? Because it's something new, and it's set right in the (one of the) homes of TechRadar towers, sunny London. We say sunny, but in The Order: 1886 it's a grim and grey place where the colour palette alone is enough to give you an existential crisis. It's serious, not fluffy. And it has guns. And knights. What's not to like? It's also not hard to understand why The Order: 1886 has been delayed. This is one of the most anticipated PS4 exclusives, and if it's to be a lasting franchise then it needs to be good. It also runs on a new game engine, RAD 4.0. Pretty much everything is working against it. On the PlayStation blog, developer Ready at Dawn's Ru Weerasuriya explained the 2015 delay was to ensure they can "deliver on the promise we made when we first introduced the game." So basically, it's still a tiny bit crap at the moment. The prospect of releasing in October against all the gigantic pre-Christmas names probably wasn't too appealing, either. Fingers crossed the 20 February release date will give Ready at Dawn enough time to perfect this potential classic. What's the excuse? "to meet our collective standards of creative excellence"
Evolve is about as high-concept as games get. It's a multiplayer title for Xbox One and PS4 that sees four people play co-operatively to try and take down a fifth. The four play as humans, the fifth as a much more powerful monster than can power up (evolve) by consuming small animals it finds. It's a novel idea, but will it hold our interest for the span of a full game? Perhaps that's what developer Turtle Rock Studios is out to improve by delaying for four months until February 2015. We know it's fun from a fairly brief hands-on, but it needs to go the distance. Like a big old leaping, terrifying monster. As part of the original release delay announcement, publisher Take Two said it was looking for a "favourable release window" - i.e. it'll sell more if it releases in February because there's less competition for your bucks then. Dropping a new IP game into this period can be like dropping a defenceless piece of steak into a pond of pirhanas. However, in a later statement given to Polygon, it was suggested that the extra couple of months would also give the chance for some more improvements. The first two Witcher games are among the best role-playing adventures of the past decade. Which is exactly why we can't wait for The Witcher 3. Developer CD Projekt Red is one of the few remaining fairly PC-centric game developers, and its approach helps give its console games an edge that makes them quite different from the other stuff we'll see released in 2015. People who are disappointed Bethesda is focusing on The Elder Scrolls: Online rather than making a 'new Skyrim' should have both eyes on The Witcher 3: Wild Hunt too. It's a drop-dead gorgeous open-world role-playing game with all the exploring and storytelling you'd expect. Originally The Witcher 3 was pencilled in for 2014, before being delayed until 2015 in May. In July, the game's creative director explained to GameRant that the delay was in order to improve the open-world experience. CD Project Red is one of those 'it's ready when it's ready' developers. Fair enough, considering the quality of its games.